From 12pm til closing, Old Devil Moon in San Francisco will be providing a sh!tstorm of kegs from fabulous breweries like Sante Adairius, The Rare Barrel, Modern Times, Phantom Carriage and many, many more! Perfect way to to kick off the weekend. Details here. Celebrate Groundhog Day at San Leandro’s Cleophus Quealy! The Bill Murray classic will be playing on repeat all day while you sip on this brewery’s newest addition to the sour fam: Violet Delights. According to Cleophus Quealy, this sour “spent months in gin barrels with lemons, cherries and violets”. Yum! Plus, don your best Bill Murray costume for a chance at an awesome prize! Event starts at 2pm. More info here. With 20 American sours on draft and even more by the glass and bottle, you’ll have a hard time picking which sours to try! This event is taking place at Monk’s Kettle in San Francisco and is *bonus* pet friendly! Event begins at 11am, with the option to buy breakfast sandwiches at 10am if you’re in line prior to the event. Pucker up! Get more details here. Horror fans unite! With beer! Oakland’s own Ghost Town Brewing will be teaming up with Church Key in San Francisco for this creepy event. Scary flicks include Evil Dead, Evil Dead 2, Army of Darkness, Cabin Fever and The Fly, which will all be paired with great tasting brew. Bring a friend or partner if you scare easily! Kicking off at 5pm at Church Key. More chilling details here. If you’re in the East Bay and don’t want to make the trek to the city, check out Alameda’s Almanac Brewery and Barrel House! The brewery will be celebrating the release of their Farmer’s Reserve No. 5 which has been “aged for months in oak with a delectable mix of strawberries, raspberries, cherries, and nectarines”. It’s like a farmer’s market of flavors! They will also be featuring a few other releases as well as their staple sours on tap. Plus, wood-fired pizza will be served starting at 2pm! This event starts at noon and goes til closing. Dogs allowed at seating areas outside. Find more info right here. You don’t want to miss this one! Presented by Jupiter, Triple Rock Brewing and Drake’s Brewing, this festival highlights and celebrates more than 60 unique sour beers from renowned brewers. The tastings will take place at Jupiter and Triple Rock. This event kicks off at noon and tickets start at $35. Purchase them here. Think your doggo has what it takes to win a talent show? Show off their stuff at Cleophus Quealy’s Puppy Bowl Party! Prizes will be awarded to the most talented pup. Cuteness overload! Cleophus Quealy will also be celebrating their newest release for Beer Week, Violet Delight, as well as offering other tasty sours for your Sunday. Pet all the dogs and drink all the beer! Details here. Join your friends at The Rare Barrel in Berkeley for the Super Bowl! The game will be on while you enjoy delicious sours and guest beers. If you get hungry, Real Smoked BBQ will be serving up tasty bites that will pair perfectly with your brew! From 1pm until close. Get the group text going now and notify your friends! All the info here. Looking for more ways to watch the Super Bowl instead of staying at home again this year? Head to the Barbary Coast Taproom in San Francisco for a Super Bowl viewing party accompanied by yummy sours from Engine #9, Logsdon Farmhouse Ales, Cantillon, and more! Starts at 2pm. Check out the details here. You don’t have to get dressed up for this brunch event, but the staff will be in their best attire to serve you this Sunday! A full buffet experience awaits you cooked by the Woodfour culinary team at Woodfour Brewing Company in Sebastopol. Tickets range from $15-43, depending on which experience you choose. Beer Mosas, delectable treats, and more will be available. Of the beers being offered, we’re most excited about the California Wild Strawberry Sour Beer. Seats are filling up fast, so get your tickets here while you can! Dive into our SoCal neighbors’ delicious selection of sours at The Good Hop Bar and Bottle Shop in Oakland! The third annual event will feature sours from breweries including Artifex, Bottle Logic, Rip Current, Good Beer Co, Smog City and more! This year, they are also bringing back curated cheese pairings which will be selected by The Good Hop’s bartender and cheese expert Paul Klevan. Your tastebuds will thank you for treating them to this cheesy sour event! Get more details here. These are only a few of the vast number of sour events happening this weekend. 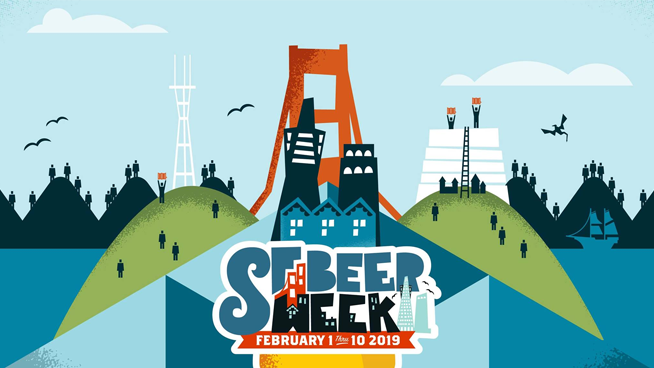 For the full list and other events that aren’t sour related, check out SF Beer Week’s site!